George, who is already the proud owner and restorer of a really nice Portafold folding caravan, has come up trumps and found this really rare folder, in the unusual shape of a Farlander Land Cabin, no less! 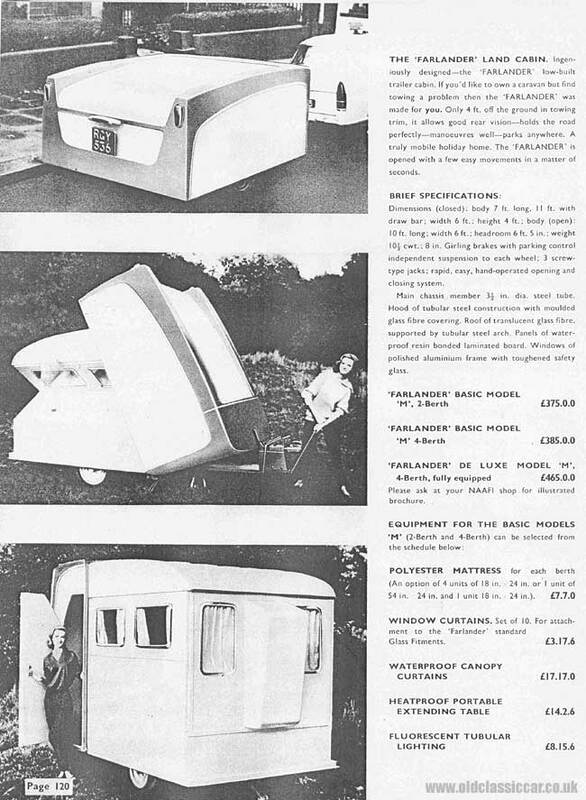 Can anyone provide more details about these rare caravans? there can't be many survivors, so any news of other survivors, or even memories of holidays in one of these old caravans, would be much appreciated by George. "The fibre glass became alloy sheet over steel framing. I have some poor pics on a photo copy from a book, it didnt look half as nice. The entrance end sky light hatch is in fact the number plate mounting so when you put it up the plate sits at the angle! When I study it all, its very cleverly thought out but you have to follow a very strict proceedure to erect and fold it otherwise damage can be done. 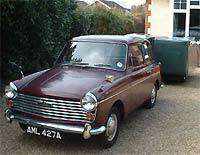 I can see its a bit too fussy for most people and the high cost made it a curio more than a general use van. It has plenty of potential for trapped fingers! I think the designer must have got carried away with enthusiasm more than a business head. The blockboard sides and furniture are heavy. Its 1.5cwt more than the Portafold. Stangely it never had a jocky wheel which is a pain really." "We went to Wyke Down, Andover today, our first outing with the Farlander. We got there late and had to set up in the middle of a field surounded by all and sundry. To say it caused a stir was an understatement, we were inundated, swamped with viewers, quizers, other van owners and even the previous owner from before my seller!. We didnt get away for 2 hours and missed most of the exhibits! Lots of cars but only 2 A40's, a Mk1 and my Mk2. It was a great day. The A40 struggled on the hills, down to 45 in parts. At 52mph it started to sway so had to keep to 50 MPH. The van is heavy at 10.5Cwt. Got home at 8pm tired out. The A40 worked hard. " George has been in touch. Firstly, a copy of an advert for the Farlander Land Cabin, sent to him by someone who saw this in an early NAAFI catalogue. 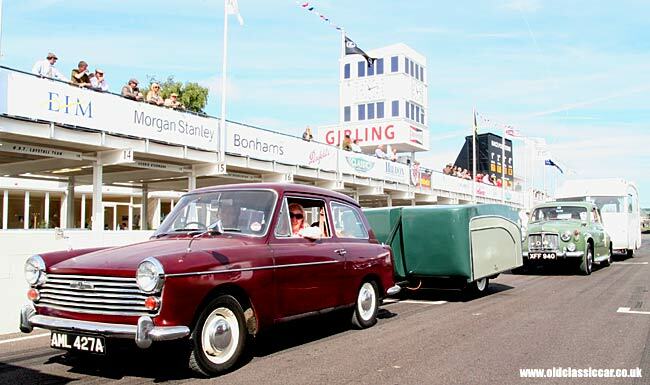 Secondly, there was a large collection of period caravans at the 2007 Goodwood Revival race meeting, and George was invited to take his folding 'van along. The photo below shows the Farlander behind his A40, ready for a lap of this historic race track. Thanks for the info George - can anyone assist with more information on the history of this caravan manufacturer?